Berghof Sturmgut stands for fabulous family holidays in Austria. Family Kletzmair warmly welcomes you! Tiscover Guarantees: Only those who booked an accommodation on Tiscover.com and who really stayed overnight can place a rating! All our reviews and comments are 100% certified and made by real guests. Liebe Familie Simecsek/Eory, vielen Dank für Eure Bewertung. Es freut uns sehr, daß Euch der Urlaub bei uns gefallen hat. Wir haben Eurer Lob an unsere Mitarbeiterin weiterleitet. Über ein Wiedersehen würden wir uns sehr freuen. Ganz liebe Grüße Familie Kletzmair. Gut ausgestattet und saubere Zimmer. Extrem freundliches und hilfsbereites Personal. Sehr gute Küche. Portionen sind auch sehr üppig. Krásné klidné místo, vynikající kuchyně a velmi přátelský personál. Spousta zábavy a aktivit pro děti. Rozhodně doporučuji, byli jsme velmi spokojeni! Dear Family Stastná, thanks for your review. We would be very happy to meet you again. All the best, Kletzmair family. Sturmgut: Family holidays in a quiet environment safe for families with children. Breathtaking views of the mountains are guaranteed! Thanks to its quiet and safe location (no traffic, no lake or river, no steep slopes) Berghof Sturmgut offers hassle-free holidays for families. Parents may watch their little ones romping about on the playground while relaxing in one of the dining rooms or on the terrace. The latter offers ample space for relaxation and play. In addition, there is a play room near the dining rooms and the terrace. The kids will love the farm and animals! Berghof Sturmgut - Walking holidays in Stodertal, one of the most beautiful side valleys in the Austrian Alps. Many loop trails start on the doorstep, or they are within easy reach. Thanks to major signposting efforts orientation is made easy and you may easily walk on your own, without joining a local guide. The picturesque landscape, the unspoiled environment and the close proximity to the Kalkalpen National Park make this place a paradise for walking and nature enthusiasts. For even more peace and quiet we recommend to book during off-peak season. The Kletzmairs look forward to meeting you! Located next to the ski run - a privilege shared by only a few accommodations in Austria! Skiing holidays at BERGHOF STURMGUT: Open the front door, get on your skis and hit the slopes! Located next to the ski run, our house offers easy access to the Hinterstoder ski lifts. Enjoy skiing from the very moment you leave the house - there is no need to take the car or the ski bus to get to the ski area! Having spent the day out skiing, there is nothing to beat a few moments of relaxation at our small in-house spa with sauna (with wood-burner), steam room, freshwater Jacuzzis, infrared cabin and workout facilities. Berghof Sturmgut is in a lovely hillside location some 200 meters from the town center. It is accessible by car even in winter (please note that snow chains are obligatory!). 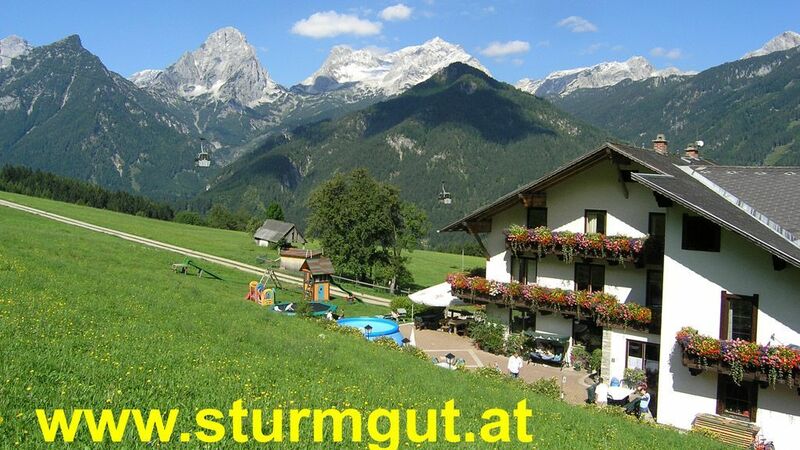 Sturmgut - Farm holidays in the mountains with all modern conveniences! Our offering comprises 5 family rooms, 3 apartments, 3 double rooms and 3 multi-bed rooms. The kitchen on the first floor is open to our guests 24 hours a day. Facilities include two hotplates, a microwave oven, a refrigerator, a bottle warmer, and crockery and cutlery. We provide plenty of hiking equipment and child facilities to save you the hassle of carrying excess luggage. Just tell us what you need upon reservation! Enjoy your breakfast (buffet-style) between 8am and 10am. Dinner is served at 6.30pm and comes with a salad bar, two soups to choose from, a vegetarian meal or a meat dish with sides, as well as a dessert and a selection of cheese. We also consider the special needs and tastes of children. Children are welcome to help themselves to free fruit juice all day. Our guests are welcome to make use of the in-house spa facilities (basement), which are easily accessible from all rooms and apartments. Facilities include a sauna with wood-burner, an aroma steam room, showers, fog and bucket showers, an infrared cabin (accommodates 2 people), 2 fresh-water Jacuzzi tubs, a relaxation area and a small room with workout facilities. Easy to reach from all over Austria and Europe! Take the first road to your left after the church (large yellow sign) - continue up the hill for about 1.7 km to the end of the road. Please note: The road climbs considerably (7 to 14 %) - snow chains are required in winter! Hinterstoder station is located at the beginning of the Stodertal valley, at 13 km from the farm. 20 trains reach Hinterstoder station daily. ** For these trains shuttle buses must be ordered by telephone - please let us know and we will organize these buses for you! You will be taken to Hinterstoder town hall, where we will be glad to pick you up by car, just tell us when you are going to arrive! Tickets are valid for 3, 4, 7, 10 or 14 days and offer unlimited transfer on all ÖBB trains (2nd class) and all ÖBB buses. Tickets can be bought only in combination with a hotel booking - see package deals. NOTE: RYANAIR and AIRBERLIN passengers are offered direct transfer to Berghof Strumgut for only EUR 29 per person (one-way). Free transportation for children aged 2 years or younger; 50 % off for children aged 3 to 12 years. To be booked together with your accommodation at Berghof Sturmgut. All airports mentioned above offer car rentas points.